Lots of snow falling at the moment and we are very excited. Here is a bit of video to get you excited too!! Ski lessons and ski touring with native English speakers in the Chamonix valley. No matter if you are taking your 1st tentative turns, trying to overcome the intermediate plateau, want to improve your bumps, take up carving or looking to progress in the back-country we are able to help. Our philosophy is simple, keep it safe, fun, relaxed and about you. Our goal is to make your learning experience personalised to your needs, even if you are in a group environment. Safety is of course of paramount importance, even when we are challenging you and your skills. Taking on information is not easy in a stressed environment so keeping it fun, relaxing even when the technical level goes up is all part of a lesson with us. We are fully qualified through the British Association of Snowsports Instructors (BASI) and hold the French Equivalence and Level 2 race coach qualification. We have been in the Chamonix valley for 12 years teaching, skiing, touring and climbing. 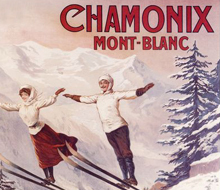 As year round residents we have a locals knowledge of the skiing in and around Chamonix. "After a lengthy (30 plus years) gap in my skiing, taking it up again in Chamonix last season was a challenging experience. The lessons I..."